In this exhibition of fifteen mixed-media paintings, Fernando de Szyszlo utilizes mixed-media, charcoal, pastel and acrylic for the first time. At eighty-four years of age and after a career of about sixty years, he continues to explore media, oil, sculpture and now, mixed-media. Absorbed with bridging an abstraction originating in ancient American art to explorations of the abstract language that emerged in the twentieth century, Szyszlo is often identified with a group of Latin American artists--including Wifredo Lam, Roberto Matta and Rufino Tamayo--whose production also explored those concepts. With and like them, he also forged an understanding of the relationships between visual art and literature, extending an early twentieth century Latin American tenet into the contemporary era. Friendships with Octavio Paz, whom he first met in Paris in the fifties, the Peruvian novelist Mario Vargas Llosa and Cuban/exiled novelist Guillermo Cabrera Infante have been points of reference to and about Szyszlo’s work and persona. Also informing this exhibition is a life-long intellectual fascination with Peruvian pre-Columbian civilizations. In his work he has consistently drawn on a visceral understanding of the Peruvian landscape and its people. The Nazca plain and its ancient funereal textiles and the mythologies and rituals of an ancient time act as an internal reference in these works, but not as overt representation. Szyszlo begins by drawing directly on the canvas. Charcoal lines construct the work, creating the volumes and planes that define the composition. Acrylic paint saturates the space and adds the dimension of color. “Dimension” because the color values range from the lightest of shades and shadows to deep, dark strokes. In the series of paintings entitled “Trashumante I, II, IV and V' (translated as “nomad,” “shepherd,” or even “wanderer”), Szyszlo focuses on the omnipresence of shepherd/nomads, who are traditionally Quechua, the indigenous people of Peru. Tending their flocks, these people have for centuries, traveled and re-traced age-old pathways on their constant journeys from lowlands to highlands. They embody a recurring rhythm and a tradition with which Szyszlo identifies. for he too, wanders the world seeking and exploring links that he uses to gain access to his ancestral language. Images suggestive of that ancient past re-emerge as abstract and architecturally rendered figures and monoliths. 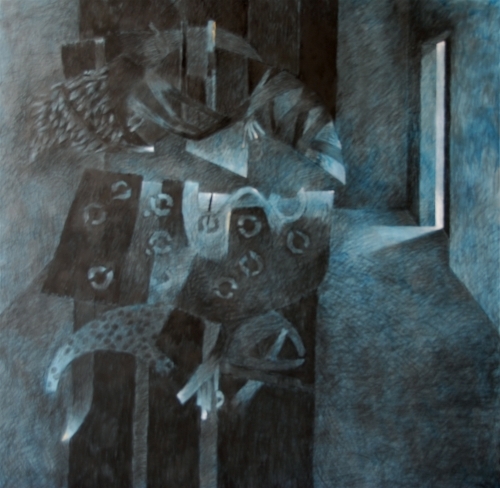 In “Trashumante I” an angular, architectural quasi-human monolith emerges within a light-filled bluish space set off between two charcoal bands that frame the image, creating diagonal planes that draw the eye into the bluish interior space. The viewer is brought into direct confrontation with the figure. Its darkness is heightened by criss-crossed bands that adorn two pillar-like legs, and reddish streaks that heighten the hard edges of beaks, eyes, and talons. Summoning memories of ancient deities divined from another sphere, this figure resides beyond human experience. By contrast, “Trashumante II,” is completely saturated with a violet-lavender-pink palette. A minimal touch of charcoal defines the lines of the work, creating the space in which a figure composed of two leg-like appendages and two animal heads, one facing left, the other turned toward the center, inhabits the same mythological space as “Trashumante I.” Abstraction gains the upper hand in “Transhumante VI” as Szyszlo reduces the image to a large rectangle, becoming lighter as the whiteness ascends and emerges from its dark space. A fine red line accents its edges, and a small indentation identifies its right side. In “Piedra de Sol (Homenaje a Octavio Paz),” there is an association between poetry and painting related as it is to Paz’s poem of the same title. An homage to the enormous circular disk known as the “Piedra de Sol,” or more popularly if inaccurately, as the Aztec calendar stone, the poem’s 584 lines are linked to the planet Venus’ passage through the sky and is also a calendar system, invented and used in ancient America, particularly among the Mayas. Circular in form, the opening lines are repeated at the end even as the cycle and the poem begins again, an affirmation of cyclical time and space. In contemporary terms, the spatial and experiential wanderings of the narrator follow a trajectory re-tracing that ancient cycle. Even though “Piedra de Sol” utilizes charcoal and acrylic, it is the compelling draftsmanship that dominates the composition. Again a monolith-figure, this time in profile, occupies what in this case is empty space. The head is a flurry of exquisite fine lines swirled around, caught and tied here and there. They fan out, scattered here and there on the face and downward throughout the body. The body itself is a series of planes joined in the middle and descending downward, the curvilinear lines converging to form a phallic form. One large and aware bright eye looks out, it’s gaze fixed on something beyond, to the right of the limited space it inhabits. The mouth opens in a silent shout. Awe, surprise or perhaps terror? Paz has written about the strangeness, the unease, the “marvelous and horrible” feelings that pre-Columbian objects evoke in the Western eye. Something of this confronts us in this figure as it looks beyond the frontiers of our perception. In an interview in 2005, Szyszlo stated that “Octavio Paz and I have been the contemporaries of all men.” Poet and painter were and are members of an expanded world, beyond national and cultural borders. For Szyszlo (and Paz), the Now is all that matters. Thus, the entire existential weight of facing the unknowable is a contemporary problem. Omnipresent ,it erases linear time. The unknowable existed in the then as it exists in the now. In opening up those possibilities in these works, de Szyszlo again bridges the concept of what we call the past with the concept of the present. In so doing, perhaps he also reveals to us that age 84 is only a number, a cipher floating in space.